Her life-long prayer has been “Jesus, I trust in you” and in doing so she has followed her calling to do God’s work. From her current position as a Pastoral Associate at Our Lady of Lourdes Parish in Decatur, IL to various other assignments including hospital laboratory supervision and administration, Sister JoAn Schullian, OSF has placed her trust in God to lead her in her life. In June 2006, Sister JoAn will celebrate her golden jubilee as a Hospital Sister. “I am grateful to God, my parents and family, the many teachers of God’s love, and especially our Sisters for all the opportunities I have experienced and for all the challenges for spiritual and emotional growth over the past 50 years,” Sister JoAn said. A native of Quincy, IL, she earned an associate’s degree from Springfield College in Illinois and certificates in Medical Technology and Blood Banking from St. John’s Hospital. She holds a bachelor’s degree in Medical Technology from DePaul University (Chicago, IL) and a master’s degree in hospital administration from Xavier University (Cincinnati, OH). She also earned a Certificate in Pastoral Studies from Catholic Theological Union (Chicago) and is a member of the NACC (National Association of Catholic Chaplains). Throughout her life, she has faced personal and professional challenges but remained faithful in her prayer of “letting go and letting God lead me.” As a result, she found comfort in listening to God’s spirit and was blessed with inspiration to move forward in various healing ministries. “By the 7th grade, I knew deep in my heart that I wanted to become a Sister and help people who were sick, elderly and poor,” Sister JoAn said. Her realization would be confirmed in an inspirational setting during her high school years. While riding a horse on a farm in Missouri, Sister JoAn felt called to Religious Life. “I felt God’s presence, His encouragement, and His call,” she explained. She wasn’t afraid of the realization and felt at peace. It was from that moment that she knew what direction she would take for her life after high school. Later, as a senior in high school, she spent a weekend at the Motherhouse with others who were considering religious life. After prayer and much searching, “I felt the Holy Spirit encouraging me to enter our Community. I was drawn by the Sisters’ prayerfulness, peace, kindness, and their hospitals and other ministries,” she said. 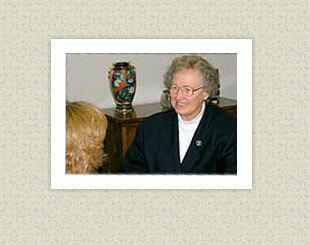 "My aunt, Sister John Baptist Schullian, was happy that I chose our community," she added. As the oldest child of two sisters and one brother, Sister JoAn has many fond childhood memories. For example, her father and uncle owned and managed two grocery stores and she helped as a clerk and in stocking shelves. Sports and music have always been priorities in her life. She began playing tennis as a child and as an adult competes in tennis, cycling, table tennis, pool, shuffleboard, and race walking in some State and local Senior Olympics. During grade school, she took piano lessons and played French horn. While working at St. Vincent’s Hospital, Green Bay, WI, in the 1960s, she was asked by the chaplain to learn the trombone and later learned to play the trumpet. Sister JoAn joined 13 other Sisters in forming a Sisters’ orchestra at the hospital which played for hospital Christmas parties. Sister JoAn finds great reward in her current work in parish ministry. She has many opportunities to listen, to encourage, to teach, to bring healing, and to pray with people. She shares her personal realization of trusting in God. “My message is that by trusting in God you can be assured that He will lead you as to where, how, and what to do in whatever decision you’re facing,” Sister JoAn said. Her parish ministry work brings her in contact with many people including the sick, the bereaved, the elderly who are in need, and those interested in learning about the Catholic faith. She shares these parish ministries with many lay persons who help her reach out to others. She is very involved in social justice issues and works to abolish the death penalty. She is one of the founders and now president of Macon Citizens Opposing Capital Punishment and a board member of the Illinois Coalition to Abolish the Death Penalty. In addition, she and the other Sisters in Decatur continue to be involved with activities at St. Mary’s Hospital (Decatur)…one of the 13 hospitals sponsored by the Sisters. “God has blessed me and I have received so much from Him. I am grateful that I can continue to have opportunities to share God’s healing love with others,” she concluded.